A Few Random Things and a Recap of the Final Weekend Trip – Oh Man, Oman, Man! So I’m a little behind now. You might have seen that I got back home last Saturday, the 4th, appropriately. But I still have another few posts to make, so I’ll be playing catch-up for the next few days! I wrote this last week but wasn’t able to upload the photos because of the internet connection. One thing that I’ll miss about Oman is the design of the signs for most stores here: they’re incredibly tacky, and most of them look very similar. They’re a little hard to describe, but I have some poorly photographed examples. They usually have the name of the store in Arabic and English, and a lot of times they say “Sale of…”, e.g. “Sale of Water Purification Equipment” or “Sale of Ice Cream”. They use the same simple font with a loud, solid background color, and then they are loaded up with cut-out pictures of whatever the store sells. And a ton of the signs are like this! It was this way in Muscat, Sur, Manah, and Nizwa. Last weekend, we went on our final weekend trip to Sur on the East Coast of Oman. It wasn’t actually planned at the start of the program. The students in our group were going to put in a proposal and plan the trip ourselves if the college would grant us permission to go anywhere, but the college decided to pay for the trip and provide us with transportation! This was the original destination of our previous trip that we were unable to visit because of the storm. On the way to Sur on Friday, we stopped at another wadi, Wadi Shab. This wadi was incredible because it not only had beautiful, clean water that we could swim in, but the river was in the middle of a massive canyon. The trip was a little bit complicated though because of Ramadan. Hiking through the canyon took about two hours when going quickly, and none of us drank any water all morning before the hike because it’s considered rude to drink in front of people who are fasting. I only had one bottle of water that I brought with me from the Guest House. We wound up being fine, but a lot of us had to slow down and swim to keep from getting heat stroke. I’d guess it was over 100 degrees outside, and there were no clouds. There was supposedly a waterfall in a cave at the end of the canyon, but I wasn’t able to make it there in time before I had to turn around. I did jump off of another cliff again, which was even higher than the ones I jumped from at Wadi Bani Khalid and the top of the boat in the sea near Muscat. The hike was exhausting, but it was still enjoyable. It was also cool because I probably heard more different languages on the hike than I have in the last year from all of the different other tourist groups there. I definitely heard German, French, Spanish, and Italian, and there were a few British and American groups there, too. It wasn’t crowded though; people were spread out well. Some goats near the parking area. Unfortunately, the supervisors who drove us here and the students fasting for Ramadan who chose not to hike were all pretty upset at the group for taking so long at the hike. We were supposed to spend 3 hours there when we would have gone the previous weekend, but they asked that we only take 1.5 hours this time. I was sorry, but being late couldn’t have really been prevented – I moved quickly and didn’t even make it to the end of the hike before I had to turn around, at which point it had already been longer than 45 minutes. It was mostly because I kept moving forward and other tourists kept saying, “Oh yeah, the waterfall is right around the corner!” Of course, it definitely was not! Everything was fine, though. We were late to our hotel, Turtle Beach Resort, near Sur, but the staff very kindly kept the restaurant open until 5:30 so that we could quickly get a lunch type thing. The hotel was quite nice – we had a private beach, and there was a lot of good Indian food. I also found a tiny hermit crab on the beach at the hotel. In the evening, we went to do probably one of my favorite things I’ve done here. In the evening Friday at 9:00, we went to Ra’as al Jinz animal reserve to one of Oman’s famous sea turtle beaches. We were split into small groups with an Omani guide who led us around with a light, and we were able to see green sea turtles on the beach. First, I was able to see a sea turtle laying her eggs! As in I actually saw them falling into the pit that she dug. Yes, I know that sounds kind of gross, but it was beautiful. Second, I saw a few turtles going into and coming out of the sea. And last, I got to sea a turtle covering up her eggs and digging a fake hole to confuse predators. That was fun because the turtle flung a bunch of sand into the hair and knocked a bunch of sand all over my body. I never thought in my life I’d get to say that a sea turtle flung a bunch of sand on me when she was covering up her eggs! I also didn’t think I’d get to see a sea turtle in the process of laying her eggs. 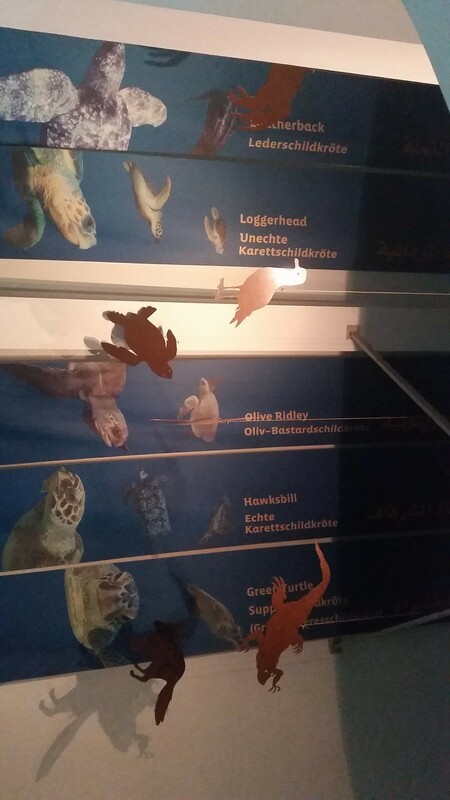 Apparently only 2 out of 1000 turtles will make it from hatching to adulthood, according to our guide. I slept in late the next day, ate another huge lunch, and left with our group to return to the Guest House. We stopped at Hiwayat Najm on the way back – a huge sinkhole that was originally believed to be meteor crater according to Omani legends. We only stopped briefly, but I was able to swim because I thought ahead and wore my bathing suit to the park! I also wore a towel the entire time I was out of the water in order to remain “modest”. More goats in the parking lot. And I’ll finish with a bunch of random photos. We played a game with our conversation partners where we had to get a coin out of a pile of flour without using our hands. The other students in the program said I looked like I walked right out of the sixties. Hey man! Great blog! I actually applied to the SALAM scholarship myself and I had a question. So a lot of my peers applied and didn’t get it, and a week after they got their emails I got one saying I was selected to go off onto the next “round” which includes taking a placement test, and then final decisions will be made. I was wondering is this test just to ensure I’m a proper level (IE, not level 0 and not fluent) or is it actually another competitive stage? I’m really nervous!